Insurance and reinsurance industry losses from severe thunderstorms and convective weather in the U.S. continue to mount, with another period of storm activity between 26th and 30th March 2017 likely to contribute another $1 billion to economic and insured losses, according to Aon’s Impact Forecasting. The insurance, reinsurance and ILS fund industry faces another year of rising losses due to severe convective weather, causing thunderstorms, tornadoes, large hail and high winds. In 2016, severe convective storm losses helped drive insurance industry losses across the U.S., becoming the latest year where the tornado, hail, wind and rain from thunderstorms became the largest driver of natural hazard losses. 2017 is heading in a similar direction, as reports of tornadoes continue to rise to near record levels. 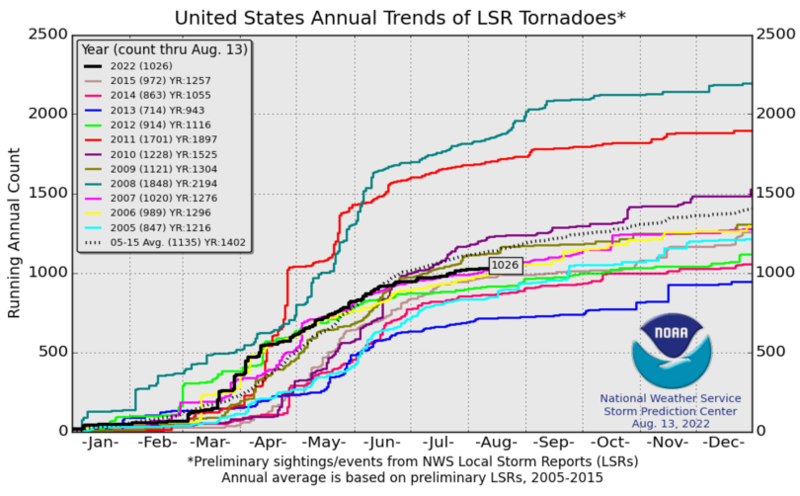 So far this year 410 reports of tornadoes have been recorded by the Storm Prediction Center, with only 2008 running higher by this point of the year. When you look at reports of tornadoes, large hail (greater than 1 inch diameter) and damaging winds from local storm reports, the number of incidents seen in 2017 is clearly high and as a result it’s safe to assume insurance industry losses will be high as well. The chart below from Impact Forecasting shows just how active 2017 has been to date for severe convective weather. The latest period of severe convective storms, between 26th and 30th March 2017, has seen further damage caused by tornadoes, hail and winds across parts of central and southern United States. Impact Forecasting explains that a series of storm systems developed and moved across the southern Plains, Mississippi Valley, Southeast and the Midwest U.S. from March 26th to March 30th, with some of the worst damage caused by large hail of up to softball size and straight-line winds gusting to 95 mph (155 kph). Dozens of tornadoes were also reported during the period. These storm outbreaks impacted densely populated areas in the states of Texas, Oklahoma, Tennessee, Kentucky, Alabama, and Mississippi, according to Impact Forecasting. The Storm Prediction Center reports that there were at least 544 total local storm reports (LSR) during this outbreak period, with 32 tornadoes, 226 reports of damaging winds and 286 of large hail. The Insurance Council of Texas has reported that it anticipates that insured losses from the 26th March storms in Texas would reach $300 million alone, which suggests the total loss across the U.S. from this recent period of severe convective weather will be considerably higher. This could be the fourth billion dollar severe convective storm outbreak already in 2017, as Impact Forecasting notes that there have already been three such events; January 18-23; February 27 – March 2; March 6-10. Insurance industry losses from severe convective storms are already well on their way to $5 billion in 2017. Data from Impact Forecasting shows that severe convective weather has caused at least $10 billion of insurance and reinsurance losses every year since 2008. 2017 is well on its way to continuing that trend. Typically, losses from these kinds of severe convective storm outbreaks will be within expected catastrophe budgets of insurance and reinsurance firms, so will pose nothing particularly unusual for the ILS market to deal with. However, the aggregation of billion dollar plus severe weather events could be a more significant impact over the course of the year, alongside any more catastrophic tornado outbreaks that occur.